Here are some photos of the Chantry Flats check dams during their construction back in the early 1960′s. The U.S. Forest Service and Los Angeles County Flood Control District teamed up to engineer and construct these Lincoln Log type structures in many of the front country canyons of the Angeles National Forest. These structures were designed to keep the stream bed’s ever-moving alluvium “in check” with hopes of reducing the accumulation of sand and rock in the Big Santa Anita’s reservoir further down canyon. Regardless of how they’ve performed, they’re here to stay for the foreseeable future. The paved fire road that you begin your descent down into Robert’s Camp is the beginning of the construction road that was bull dozed all the way past Sturtevant Camp. Another road was also built on up the Winter Creek and beyond Hoegee’s trail camp. Today you can still make out the remnant switch backs of the “Burma Road” which climbed up and past Sturtevant Falls. Look for the non-native Italian cypress, pines and even eucalyptus trees that were planted on the abandoned road bed after the dams were installed. The Big Santa Anita Canyon Trails Map depicts the location of the abandoned Burma Road. The map is available at Adams Pack Station or canyoncartography.com Following the road is a hazardous proposition any time of year, so be especially careful for drop-offs, rattlesnakes, etc. If you’ve hiked on past Cascade picnic area, you’ll strain to imagine that a road ran through here, wide enough to accomodate cement mixers, skip loaders, cranes and more. A check dam nears completion at Cascade Picnic Area, Big Santa Anita Canyon. A gunite cap will be added next. Circa 1963. The destruction of pristine riparian environments would be unthinkable in our day and age. Yet, during the late 1950′s, this type of project was considered prudent land management and protection of watersheds. 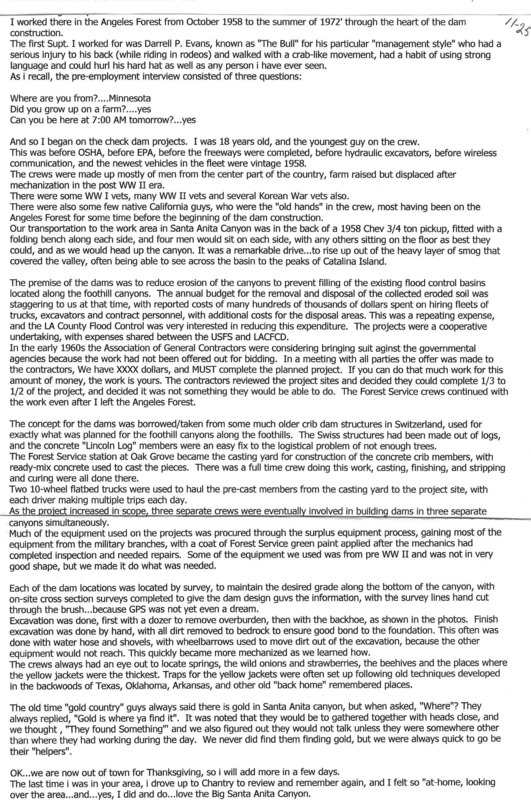 Essentially, the dams have changed the natural hydraulic grade of much of the Big Santa Anita Canyon and Winter Creek. The dams have created a stair-step type of profile in sections of the canyon bottom. Behind each dam are thousands of cubic yards of alluvium (sand, gravels and boulders) that are for now “stuck” in a static location. One day nature will have her way and there will be a phenomenal movement of material that will wash downstream. The engineers referred to this material behind each dam as a “debris cone.” In 1969, an El Nino storm pattern brought torrential rainfall to Southern California. One night during the ’69 Flood, a number of the smaller “sill dams” blew out. A sill dam is the lower (smaller) dam that you’ll often see just below or downstream of the larger check dam. The sill dam’s function is to protect the foundation of the larger check dam. Anywhere upstream of Cascade picnic area, you’ll notice that all the check dams have their accompanying sill dams. Anywhere below the confluence of the North Fork, you’ll notice that these sill dams are missing. Look carefully and notice the exposed foundations of the dams. One day they may collapse. This all happened during one set of storms in ’69! Slowly, nature has been healing from all this damming of the canyon. Decades later you can see the ivy, black berry bushes, mosses, fallen trees and sharp-edged boulders softening the scene. Canyon wrens flit back and forth into the aging rip-rap after spring floods ring through the canyons. Stout, black rattlesnakes gently drape their coils off the edge of the walls of the dams during the warm, drowsy days of August. The canyon is gradually claiming all the dams. We’re just hiking and feeling all this. in one part of this long, long timeline. Dennis Logue is seen working on uppermost check dam in Big Santa Anita Canyon. July 1962. He’s the third man out to the left near the future spillway. Second letter describing challenge of road building and method of applying gunite. 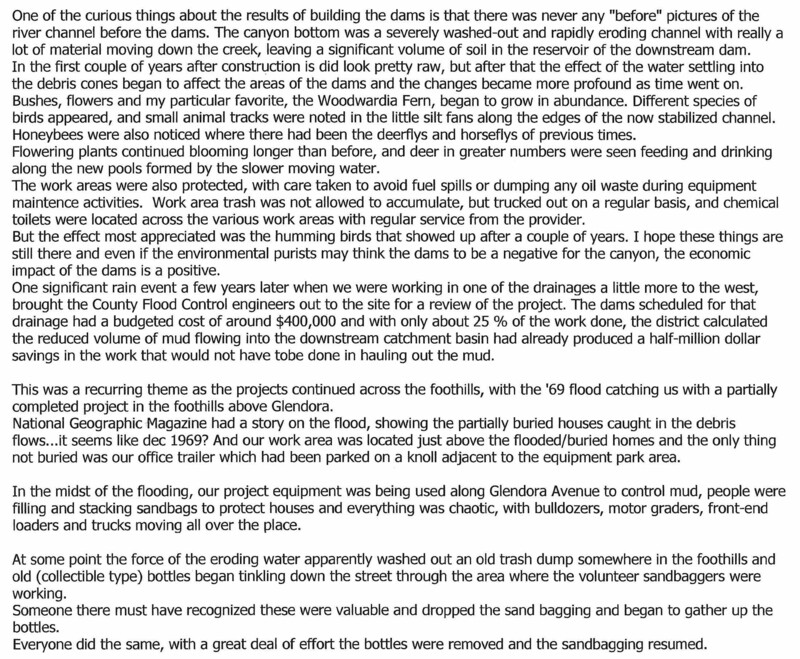 Third letter describing return of riparian plants and local animals. Response to 1969 Flood. 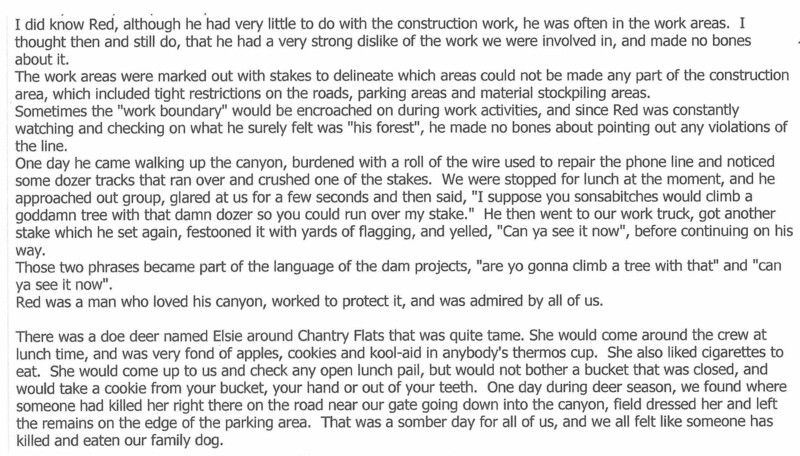 Fourth letter covering Dennis’ experience working with the crew on dams along with details on excavating for check dams. Wild lilac blossoms, green grasses and blue skies preview the start to a beautiful day of hiking the Big Santa Anita Canyon Loop. The Big Santa Anita Canyon Loop is perfect for day hiking as well as backpacking throughout most of the year. Whether you’re in search of being alongside a rushing mountain stream, seeing one of the most beautiful waterfalls in the Angeles National Forest or getting a good hill climb with vistas out toward the high country, this hike’s for you! 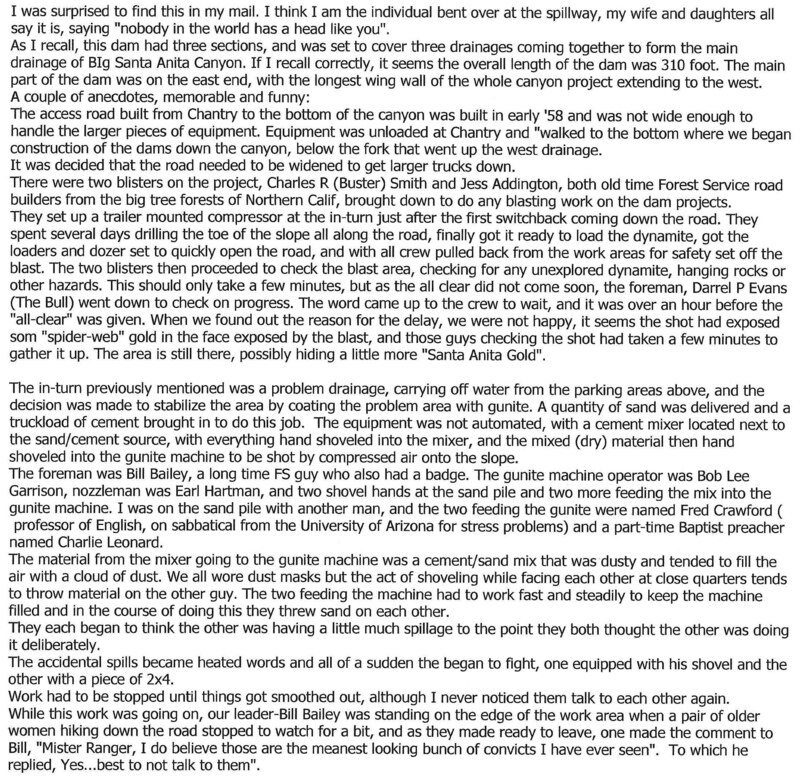 Let’s say that you decide to do the trip counter-clockwise, then you’d start at the Gabrielino trailhead, dropping 0.6 of a mile down the paved road (gated) to Robert’s Camp. Here you’ll cross the green metal and wood hikers’ bridge, which has been here since 1950. 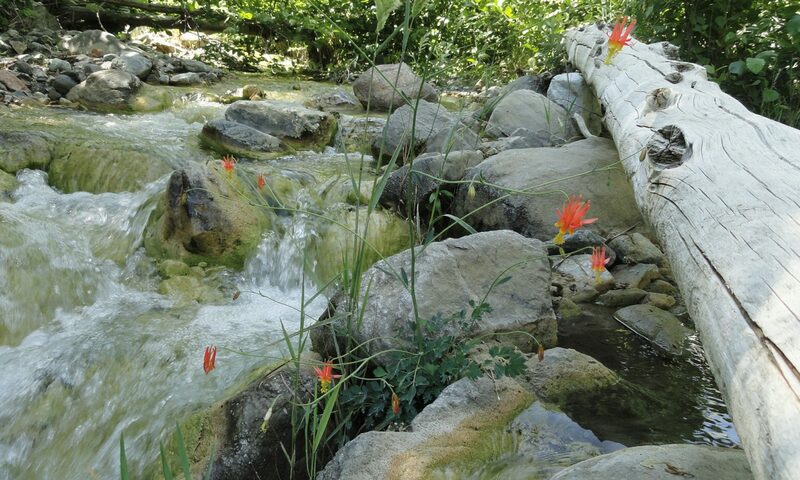 Robert’s Camp is located at the confluence of the Big Santa Anita Canyon and Winter Creek. Once a trail resort during the Great Hiking Era, it’s now an important junction for trail users. On this loop trip, we’ll head toward Sturtevant Falls and Spruce Grove. Less than 0.8 of a mile up canyon from here you’ll come to idyllic Fern Lodge junction. Dotted with picturesque cabins nestled along the verdant banks of the stream, Fern Lodge is a beauty spot of large canyon oaks leaning out over the trail. Stands of white alder grow tall and straight, nestled in close along the tumbling stream. Boulders, some bright white, others speckled with black mica, and still others solid gray or banded in alternating layers make up the jumbled stream bed. At this junction you can head up the Upper Falls Trail, which is for hikers only, if you want to see Sturtevant Falls from up above. Also, you can take the Gabrielino trail, which is for both hikers, pack animals and mountain bikes. Regardless of your choice, both these trails rejoin a mile up canyon at Falling Sign Junction. If you choose to take the Upper Falls trail, not only will you be rewarded with a great view of Sturtevant Falls, there will be a series of rock-ribbed pools that you’ll pass along. Some of these are great for cooling off during the warmer months of the year! The water’s chilly, usually never reaching the 60 degree mark. Past the pools, the canyon stays wild and narrows down into a rugged and twisting place, shaded by bay trees and maples. If it’s the right time of day, there can be a gold-green light filtering down through the trees to the canyon bottom. A couple of stream crossings further up, your trail loops back up toward the Gabrielino trail at Falling Sign junction. Here you’ll hook around to your right, continuing on to Cascade Picnic Area. This next half mile takes you into both Maple and Tiger Lily canyons. You’ll also have a great view down into the canyon from where you’ve just been. There’s a beautiful overlook that you round, just prior to dropping down into Cascade picnic area. At Cascade, you’ll find a lonesome little table and a call box (for reporting emergencies). Big Cone Spruce begins to make its’ presence here along with mature Canyon Live Oak arching out and across the stream. Cascade’s name speaks for itself, you won’t be disappointed. Up canyon from here you’ll climb up and over nine check dams to Sturtevant Camp. To many, this is often the steepest part of the trip to Spruce Grove campground and Sturtevant’s. In 0.7 of a mile, you’ll reach Spruce Grove campground for those wishing to spend the night on the ground. It’s located at 3,000′ in elevation alongside the year-round stream. It is well-shaded, mostly by bay trees and occasional spruce. There are seven picnic tables, metal rings for campfires, Klamath stoves (flat metal plate to cook on) and restrooms. Make sure to obtain a fire permit prior to your trip! They’re free and you’ll be required to have one if you’re planning to use a backpacking stove or build a fire. Just 0.3 of a mile above the camp is an important trail junction. At this junction, just below Sturtevant Camp, one can turn right and head toward Newcomb Pass and on into the West Fork of the San Gabriel River. The way we’ll head on this trip is to the left and up and over the check dam. If you need drinking water, head up into Sturtevant’s. Here they have a drinking fountain with potable water. A real luxury this far in! Don’t forget to check out the big rope swing and have a look at the place. Sturtevant Camp has been here since 1893 and continues to be available as an overnight destination. Reservations are required and can be made through the Adams Pack Station website: www.adamspackstation.com This is a very cool place to spend some time in the California of old. From Sturtevant’s, head back down to the trail junction above the dam and head across the stream, where you’ll bypass the camp and travel a very short distance upstream before arriving at the Upper Mt. Zion trail junction. Here you’ll still be across from the camp. Peel off to the left, climbing into a watered side canyon. The Mt. Zion trail contours northeast facing hillsides, climbing 300 feet in just over a mile. Along this stretch, you’ll have vistas out toward Twin Peaks and Mount Waterman. Once at the saddle (watershed divide) you have the option of doing a quick side trip to the summit of Mt. Zion in all its’ shaggy chaparral glory. Heading over the saddle, you’ll drop steeply down into the Winter Creek. You’ll be out in the chaparral, with lots of options for views down into the San Gabriel Valley, Chantry Flats and across to Manzanita Ridge. After a 1,000′ drop in elevation, you’ll encounter the Lower Mt. Zion trail junction. If you want to see Hoegees campground, turn left and head downstream a very short distance. This is also a beautiful campground, replete with a magnificent oak canopy and over 18 campsites. We’ll turn right at the junction, heading upstream a short distance, crossing the stream and then encountering yet another junction. This junction’s really important. Make sure to turn left, back toward Chantry Flat. Make sure you don’t accidentally head toward Sierra Madre and Mt. Wilson! From this junction, head left and into a drainage that sometimes has water skimming down a rock face you can reach out and touch. Keep climbing, at times steeply, until after less than a third mile the trail will level out. I mean really level. You’ll love coming back into Chantry Flats on this Upper Winter Creek trail. Near the end of the trail, you’ll come around a ridge that’ll afford you a view of the Chantry Flat area. You’ll see the parking area, people trudging back up the paved road where you began your hike hours earlier, hear the sounds of folks enjoying the picnic area and maybe even hear live music coming from the Adams Pack Station if its’ the weekend. Eventually, after crossing the tranquil little stream in San Olene Canyon, your trail will intersect the paved San Olene truck trail coming up out of the picnic area. Make sure to turn left on the road and make your easy descent into the parking area. If you’re hungry or thirsty, make sure to stop by the Adams Pack Station for drinks and good food! Also, you can pick up good maps of the canyon’s hiking trails and check out their book display. Big Santa Anita Canyon Trails Map is a large-scale map that will cover your entire hike. This map is available at the Pack Station or you can purchase it online at www.canyoncartography.com By the time your day’s over, you will have gotten over 9 1/2 miles behind you! This Big Santa Anita Loop is a great way to spend your day or weekend.